There is a one time Initiation Fee of $400.00. There are NO fees for use of the club aircraft or equipment! Dues are $35.00/month. 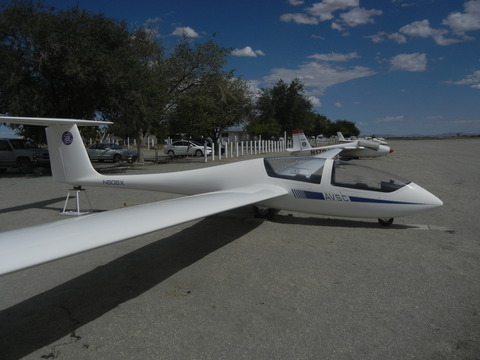 Members that own a glider are eligible for reduced dues of only $17.50/month, subject to certain conditions. The extremely low dues are possible only because members actively participate in club meetings, projects and maintenance. All AVSC members are required to join and maintain membership in the Soaring Society of America at an annual cost of $64.00 per year. The SSA membership includes a monthly subscription to Soaring Magazine. AVSC currently has three instructors. The Club supplies BFR's at no charge to club members. Flight instruction is available on a case by case basis. Aero tows are provided the club. We have our own tow plane! AVSC occasionally does Auto towing on the nearby El Mirage lake bed. Saturdays, contact us for visitor info. The flight line back when we were at Krey Field.